Shockingly, 52% of all disease through the developing world is caused by bad water and lack of sanitation. These epidemics are preventable with the one thing we take for granted every day: clean water. But for the roughly 700,000,000 people that live globally without access to clean water, something as seemingly common as diarrhea can be a death sentence by dehydration. So, how can one person living thousands of miles away in a developed nation help a remote village in West Africa drill a well? Well… Scott has just the thing. charity: water is coming up on its 10th birthday of fighting to realize a world where no one drinks dirty water. In that time, the organization has helped bring the number of global citizens without access to clean water down by 300,000,000. Scott isn’t an expert in hydrology. He doesn’t have a degree in non-profit management or training in well-digging. What he has is a passion to help people and a good eye for social storytelling. By re-envisioning how non-profits raise and spend money, engage with their donor base through social platforms, and communicate success online, he has cultivated an impressive $210,000,000 from one million people. 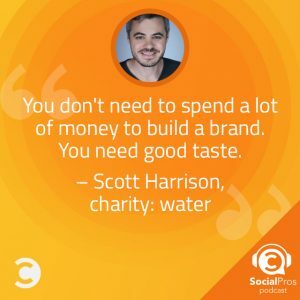 With the ability to have a direct impact through an affordable monthly subscription plan and actually see where your money goes through their donation tracking (down to geotracking the well-digging drills), Scott has effectively remade the charity model to fit the modern donor through social storytelling and effective visuals. With so much noise and clutter, it’s vital to be visual. But more than that, you need to find ways to differentiate yourself and stand apart with those visuals. It’s not enough to be just flashy. You need to be uniquely flashy. Scott sports a long list of meetings with famously inspirational folks; from Oprah to President Obama to Bill Gates. Who would he spend some time on if he could? It would be revisiting his first friend in West Africa, Alfred Sasu. Alfred received a life-changing operation to remove a 5lb benign tumor from his face that had been slowly suffocating him. Scott was able to follow his surgery, return to his village, and has kept distant tabs on him since but they have not seen each other in 12 years. If given the chance, he would jump at a Skype session with Alfred to see how he’s doing.